Agility can be a great hobby for Labradors and their owners to enjoy together. And you don’t even have to leave the comfort of your own home to give it a go! Dog agility equipment can be as convenient as a pop-up tent, and a great way to exercise and entertain your lively Labrador. Keeping his mind and body well stimulated. 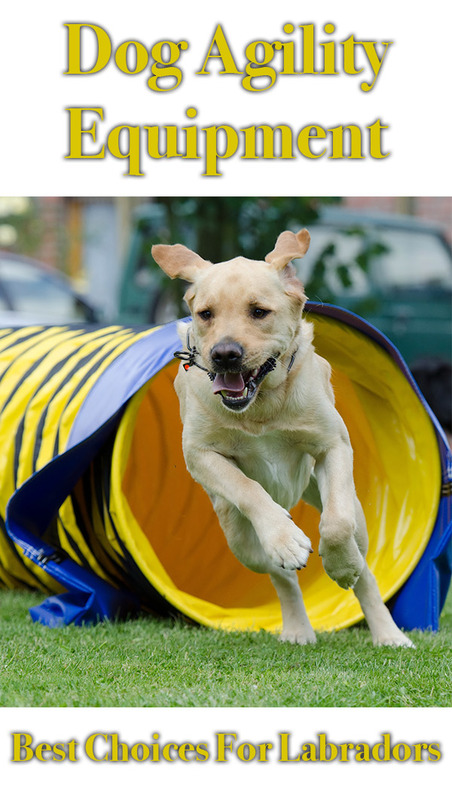 Dog agility tunnels are a very fun way to interact with and train your Labrador. You can help to encourage him through the opening and reward him when he gets to the other side. 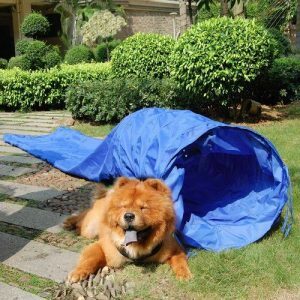 This popular and well received dog agility tunnel is 18 feet long and 24 inches wide at each opening. It has durable steel grommets and short stakes to attach it the ground in your back yard. The blue cover is also strong and wears well. It even comes with a clear carry case so that you can set it up wherever you like with easy. A great starting tunnel for someone deciding whether to give agility a go, or looking for a fun new way to exercise their Labrador. 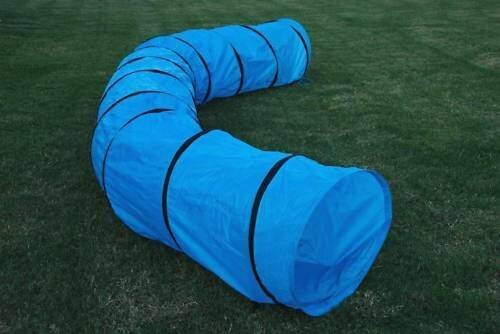 Find out more about this 18ft dog agility tunnel on Amazon here. The lightweight dog agility tunnel by Cool Runners is sturdy and well constructed, and should withstand regular use from even the largest of Labrador Retrievers. It is around 15 ft long, and 24 inches high. The tunnel is made from a thick, weatherproof, mildew and rot resistant covering, which is also UV resistant. Weighing around 20lbs, it comes with a carry case with a handle attached making it easy to transport. Great for use in your backyard, at agility clubs or even at the local park. You can find out more about the lightweight dog agility tunnel on Amazon here. 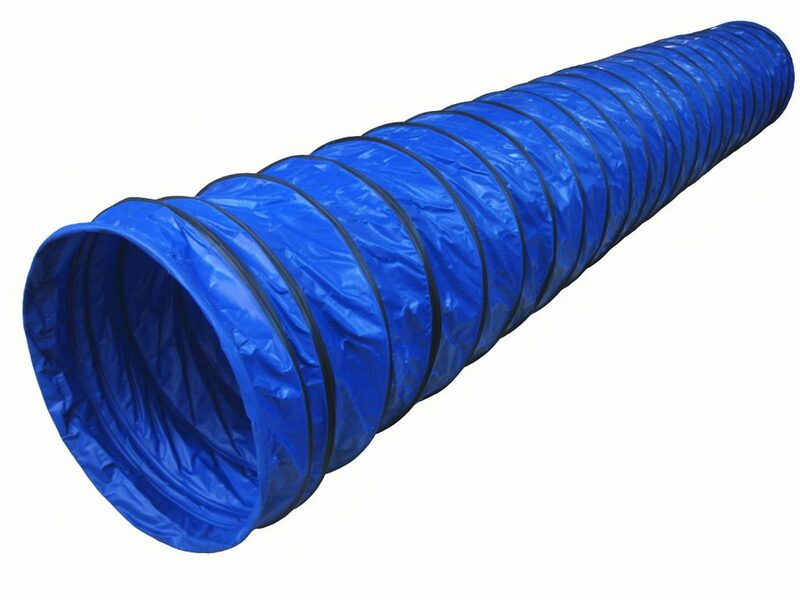 A fun alternative or addition to your open dog agility tunnel is the dog agility tunnel and chute. This is half tunnel, half unsupported material. You can have great fun encouraging your dog through the apparently closed chute after he has run through the tunnel. The HDP dog tunnel and chute is 15ft long, with 3ft of tunnel at one end and 12ft of chute at the other. The opening is 24 inches wide. The tunnel and chute material is touch waterproof nylon, which will stand up to enthusiastic use from your Lab without tearing or creating unpleasant static. The Supporting rings are steel, holding the tunnel in shape firmly and securely. Tabs and stakes allow you to keep the tunnel steady on the ground when your dog is using it. To find out more about the HDP tunnel and chute, find it on Amazon here. Dog agility jumps are a great way to exercise and bond with your Labrador. Starting with small simple jumps, you can work your way to some very fun and complex leaps with your active, fit Labrador Retriever. 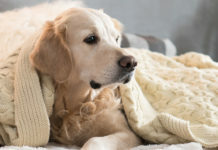 Before you begin, make sure that you find out all about how to teach your dog to jump safely by reading this article. The dog agility hurdle bar by Zoic is a great piece of starter agility equipment. The jump is supported by heavy duty stakes that can be easily inserted into your lawn. You can set the jump up easily, and it is light weight so fairly simply to transport in the carrying bag it arrives with. 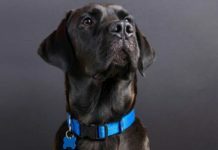 The height of the jump is adjusted with simple to use buttons, so you can start off with low easy jumps and build up height as your dog increases in confidence and his technique improves. The horizontal bar is just under 38 inches long, and the vertical supports are nearly 40 inches high. You can find out more about this great jump on Amazon here. The 2 bar dog agility jump can be used indoors or outdoors. It is 32 inches high, with a variety of potential jump heights from 4 to 26 inches. 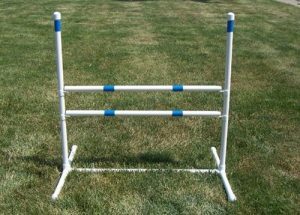 There are two bars that can be set at different heights on the jump, preventing the dog from going underneath the bar instead of over it. The bars are also easily displaced if knocked. It is quick and easy to assemble, and can be used in a variety of locations conveniently. 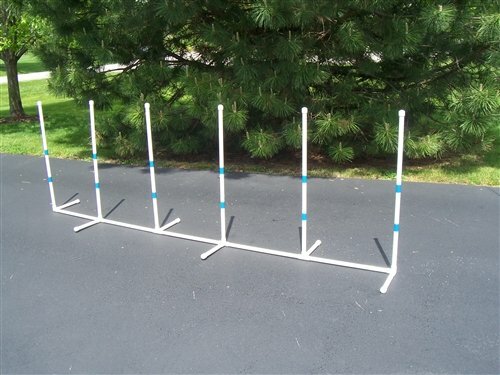 A great bar for beginners or seasoned agility jumpers. You can find out more about the 2 bar dog agility jump on Amazon here. The dog agility double jump is a great jump to progress onto when your Lab has been succeeding with a single jump for a time. The jump is set up with four vertical bars of 48 inches in height each. They can be set at a width that is appropriate for your Labrador. The supporting feet at the base work as tripods keeping it stable even on rough outdoor surfaces. They are made of high quality PVC, that is both durable, lightweight and resistant to weather conditions. This jump is a great choice for more advanced work or practicing for agility competitions. For more information about the dog agility double jump, click here. 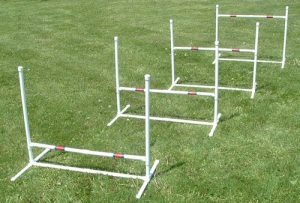 If your dog is a keen jumper and you want to make the most of this great way to exercise him, then this set of 4 jumps is a great investment. They are free standing so can be used in a training hall or outdoors, making them perfect for any weather. They each have 36 inch long bars which disconnect in the centre for convenient carrying. They are also fairly manageable to carry around, with all four jumps together weighing just 14 lbs. Find out more about the dog agility jumps travel set on Amazon here. 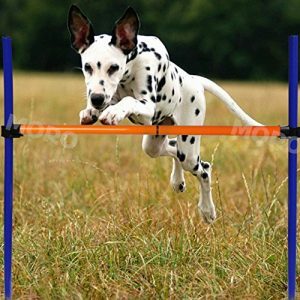 Not all dog agility jumps are traditional hurdles. This agility obstacle for dogs is a hoop jump. It is designed for use outdoors, with 34 inch spiked vertical bars holding the hoop up. The hoop itself has a diameter of around 24 inches, so your Labrador should fit through with easy. You can easily adjust the height of the hoop, starting at a point that your Lab is comfortable with. It can be easily assembled, then disassembled into a carrying bag that is included when you order the hoop. For more information on this agility obstacle hoop, visit Amazon here. Weave poles are a great, fun way to interact with your dog. Agility training which is both entertaining, incorporates your important training skills, exercises your dog and increases your bond in the process. The fixed weave poles are set in a line, with 24 inches between each of the six 40 inch tall weave poles. They are quick to put up and take down again, with simple storage and transportation. Due to supporting feet, it can be set up indoors or outdoors too. You can even separate the line to form two sets of three poles for 2 by 2 weave pole training. These poles conform to AKC standards for striping and the placing of their feet. A great choice for a complete beginner or an advanced agility worker wanting to do some extra practicing at home. For more information on the fixed weave agility poles click here. The adjustable weave poles are great for giving a bit of variety to your weave pole training. They can be set in a straight or offer fashion, and can be configured in 2 by 2’s as well as in a line. They are held firmly in place by two foot centres and a flat base. There are additional stabilising stakes also included in the package, to give extra strength when they are in use. 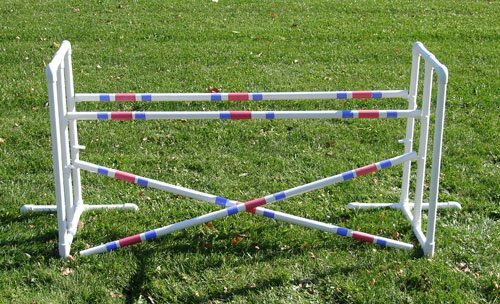 These poles are fab for practicing at home, but can also be used for training by serious agility competitors as they meet competition guidelines. The set is easy to assemble and disassemble, and light weight for transporting. Find out more about the Adjustable Weave Poles on Amazon here. Dog agility seesaws are great fun, but many dogs are understandably nervous when first trying one out. A great way around this, to build up your Lab’s confident on the seesaw, is to buy an adjustable base. Most of these do not come with the board, I am afraid you will need to pop down to the hardware store and source an appropriately sized plank. This adjustable teeter base is a good choice, with some excellent reviews. It adjusts from an almost entirely flat position to 24 inches in height at the pivot point of the seesaw. Great for having fun at home or agility training in earnest, as it conforms to AKC regulations. A piece of 12ft x 12 inch x 2 inch wood will form a suitable board for the seesaw. You can buy additional covering to go over this and give it the right texture. 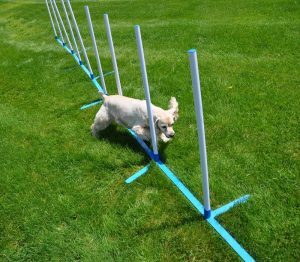 If you would like to make a real go of agility with your dog, whether at home or with a view to later competing, then you might want to invest in a full set. 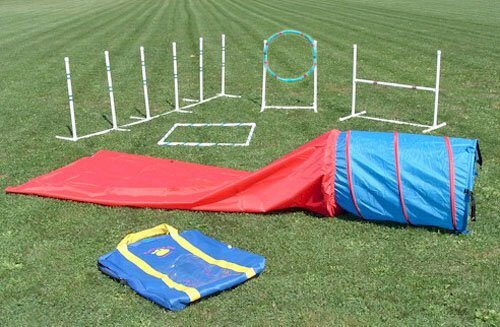 This affordable dog agility set includes weave poles, a hurdle jump, a hoop jump, a pause box and an agility tunnel with chute. The entire set is collapsible and disassembles into a sturdy carrying bag, so you can take it out with you to set up wherever is the most convenient. All of the equipment can be used indoor or outdoor, and is very lightweight for ease of transport. This great quality, great value set is very popular and well reviewed. Agility dog training with your Labrador is great exercise, fun and an opportunity to bond through training. But it can also just be a good way to allow him time to play. 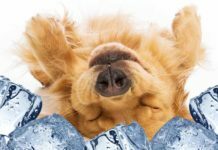 Dog playground equipment is similar to agility equipment, but without the formality or the necessity for you to join in if you would rather relax for a while in your own back yard while your Lab burns off his excess energy. 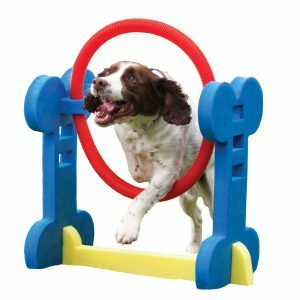 It can also be used as a great way to get your puppy enthusiastic about obstacles before you enter the world of agility with him at a later date. 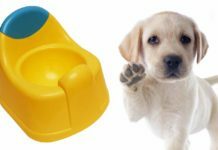 This soft foam dog play hoop is ideal for young and smaller Labs to play with in the garden. 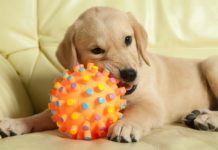 It is also a fun way to get a puppy interested and confident around the concepts behind agility, if you are wanting to look into that as a bonding or sporting activity when he is older. 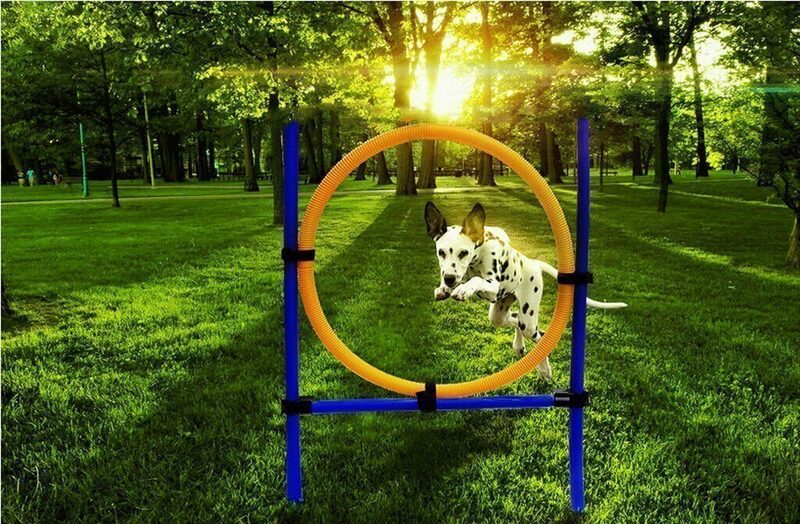 Find out more about the dog play hoop on Amazon here. The teeter and contact teacher is a low, easy to use seesaw. Ideal for pups and young dogs. 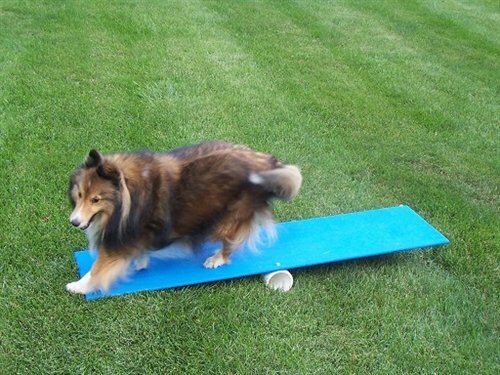 It uses the same movements as a large dog agility seesaw but at only 4 inches high, it allows your puppy to get used to the motion and gain confidence. The teeter comes assembled, and is 48 inches long and 12 inches wide. Made from cabinet grade plywood with silica sand infused for traction, this seesaw is durable and stable. It is also performance tested as fine for use by even larger breed adult dogs. So whatever age your dog is, it can make a great starting point. You can find out more about the teeter and contact teacher here. If you are handy with your toolset, then you might like to consider making your own agility equipment in your backyard. This guide provides instructions for DIY enthusiasts, to allow them to make their very own personalised kit. 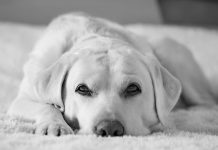 Whether you are a relaxed at home puppy parent or ready to take the next step into the wonderful world of dog agility, having the right equipment will make your time with your Labrador even more rewarding.